Kathryn Langstaff and Lita Buttolph invite you to participate in 5 part series to Awaken Your Heart. 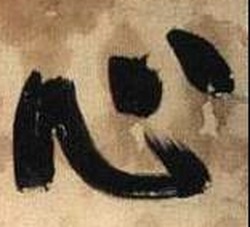 We offer this evening practicum in response to our students who miss our class tea time discussion and for anyone interested in learning about the Heart meridian and Wild Goose Qigong. In﻿ ﻿these 2 hour evening sessions invited speakers will discuss Chinese Medicine and other wisdom practices relating to the Heart. Participants will be guided in qigong warm ups and practice the 64 movements of Wild Goose Qigong to open, strengthen and bring joy to our Heart! "The Heart According to Classical Chinese Medicine and Cosmology"
"New Gesture for the Heart"
"Opening the Heart Through Music and Vibration"
"The Heart and 5 Element Emotional Healing"
"The Function of the Heart in Organizations and Community"
Please RSVP to reserve your place. Limit 30 people. 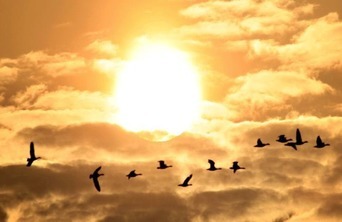 Description: This class introduces new and returning students to the Wild Goose Qigong first set. ﻿ ﻿This course is designed for both new students and returning students and is ﻿﻿open to all ages and abilities. 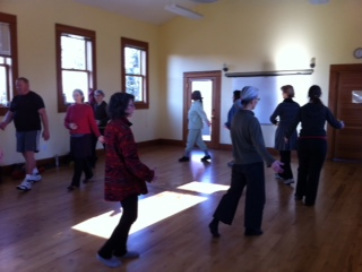 Class warm-ups are enhanced to aid in new fascial ﻿﻿patterns and foster strength and flexibility. This is a class that welcomes your ﻿﻿participation at any level of well-being and supports you in removing old blockages and patterning new healthy movements. Join 20 year practitioner, Kathryn Langstaff, in a daily Wild Goose qigong practice to harmonize yourself each day, as you develop and strengthen your qigong practice. Commit to a 30 day transformative experience! 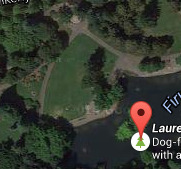 Meet in Laurelhurst Park, west of Firwood Lake in the green field near the tree cluster and the picnic table. Our 1 to 1 1 1/2 hour practice classes allow current practitioners and new students to practice taiji warm-ups, acupressure self-massage, meditation and the first set of Wild Goose Qigong. 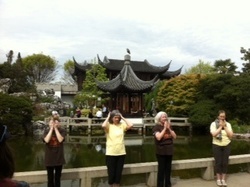 Peregrine Falcon (atop the pagoda) joins the summer Lan Su Chinese Garden practice class! Laurelhurst park in the linden tree grove, south of the pond.